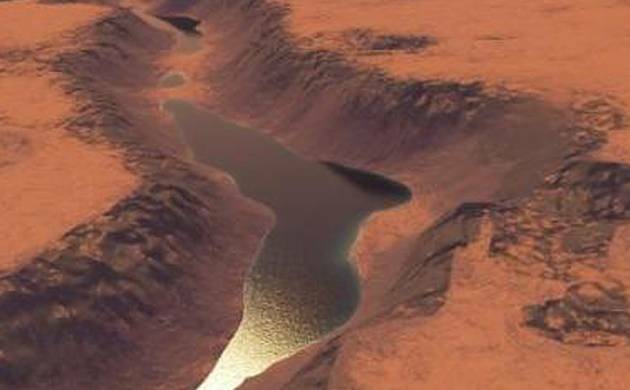 US space agency NASA’s Opportunity Mars rover has discovered evidence of ancient lake on the red planet. Opportunity has been examining the edge of a crater on Mars that may once have been a lake of liquid water. Rocks were found at the edge of Endeavour Crater by NASA’s Opportunity Mars rover. It appears that the rocks either eroded in place by wind or were transported by a flood, according to researchers. The features were spotted just outside the crater rim’s crest above “Perseverance Valley,” which is carved into the inner slope of the rim. After completion of a “walkabout” survey of the area above it, researchers now plan to drive the Opportunity rover down Perseverance Valley. Since 2011, the Opportunity mission has been probing sites on and near the western trim of Endeavour Crater, which is about 22 kilometres across. “The walkabout is designed to look at what’s just above Perseverance Valley,” said Ray Arvidson, from Washington University in St Louis. “We see a pattern of striations running east-west outside the crest of the rim,” said Arvidson, Deputy Principal Investigator of the Opportunity mission. “We want to determine whether these are in-place rocks or transported rocks,” Arvidson said. “One possibility is that this site was the end of a catchment where a lake was perched against the outside of the crater rim,” he said. “A flood might have brought in the rocks, breached the rim and overflowed into the crater, carving the valley down the inner side of the rim,” he added. “Another possibility is that the area was fractured by the impact that created Endeavour Crater, then rock dikes filled the fractures, and we’re seeing effects of wind erosion on those filled fractures,” Arvidson said. In the hypothesis of a perched lake, the notch in the crest just above Perseverance Valley may have been a spillway. Weighing against that hypothesis is an observation that the ground west of the crest slopes away, not toward the crater. The science team is considering possible explanations for how the slope might have changed. A variation of the impact-fracture hypothesis is that water rising from underground could have favoured the fractures as paths to the surface and contributed to weathering of the fracture-filling rocks. The team is analysing images of Perseverance Valley, taken from the rim, to plot Opportunity’s route. The valley extends down from the crest into the crater at a slope of about 15 to 17 degrees for a distance of about two football fields.